For decades all the cool kids have been coming to Marrakesh. Not only attracting the dropouts and hippies of the 60s and 70s, notable visitors such at the Beatles, Rolling Stones and designer Yves St Laurent have flocked to this haven located at the tip of Africa. Whatever you plan to do when visiting and however long you stay – a day, a week or a month – there are some must-sees that need to be ticked off. Start by orientating yourself at the Koutoubia Mosque, the oldest mosque in Marrakesh and the tallest structure, standing at 77 metres. If you are not a Muslim you cannot enter the mosque, which holds an impressive 20,000 people inside and another 20,000 on mats outside amongst the old foundations from the original 12th century mosque. But, you can appreciate the building as you walk around the beautifully manicured gardens which are also a good place to escape from the hot Moroccan sun. Return at sunset for some spectacular photographs of the mosque when it is lit up at night. Bahia Palace, built in the late 19th century was once home to Bou Ahmed (a former slave turned vizier), his four wives, 24 concubines and numerous children. With intricate inlaid wooden ceilings, elaborate mosaic floors and lush courtyards shaded by orange trees it is truly an oasis. Djemaa el-Fna Square is not for the faint hearted, but if you see nothing else while you are visiting Marrakesh, this is the one place you must visit. Day or night it’s heaving with people, produce and performers. 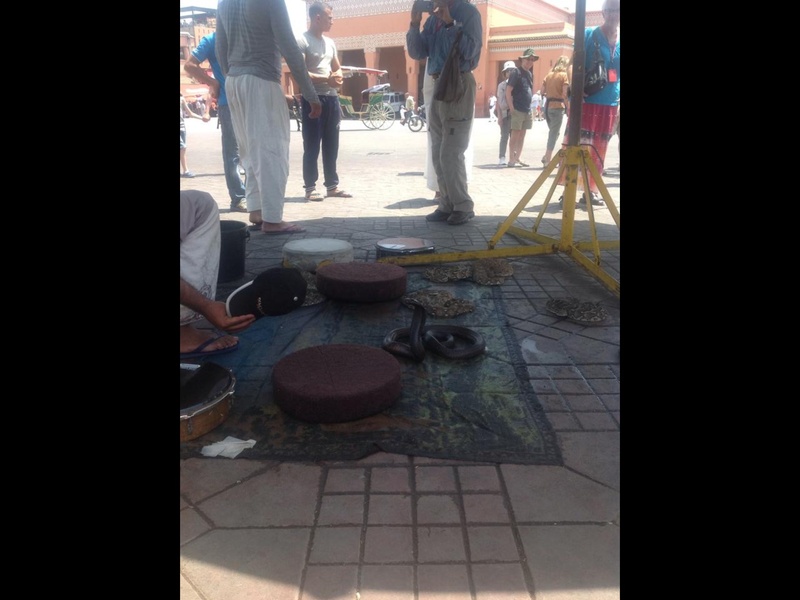 The distinctive cords of the flutes played by the snake charmers can be heard all around the Square. It is quite disconcerting to be the centre of such undivided attention as the steely eyed cobras appear to fixate on you and keep you locked in their sight. The rooftop cafés overlooking the Square are safer alternative for viewing the spectacle below if the proximity to so many snakes proves too unnerving. While wandering around the souks and Medina, try your hand at haggling with the traders – it is considered rude not to. The stall holders are very friendly and non-threatening and your purchases can be made with lots of lighthearted bantering and good cheer. Head into one of the traditional pharmacies in the souk to stock up on supplies of Argon oil if you are losing your hair, natural Viagra if you are losing your libido and various other remedies – you will find a cure for whatever ails you. As the sun sets over the Square, crowds of people form circles around the various entertainment – groups of young boys boxing, children fishing for bottles of drink and belly-dancing transvestites. Delicious smells waft through the Square from the many food stalls, but sometimes it’s better not to ask what part of the animal you’re going to be eating when you order, it could be anything from its tongue to something from its nether regions. Just be brave and give it a try. But if you really can’t get your mind over the matter, you can’t go past a freshly squeezed orange juice. The perfect end to a night out in Marrakesh is to take a caleche ride back to your hotel. The horse-drawn carriages are a magical way to appreciate the city at night, but be warned, they can be a little ‘on the nose’ as the horses have hammocks strung under their tails to catch their manure!